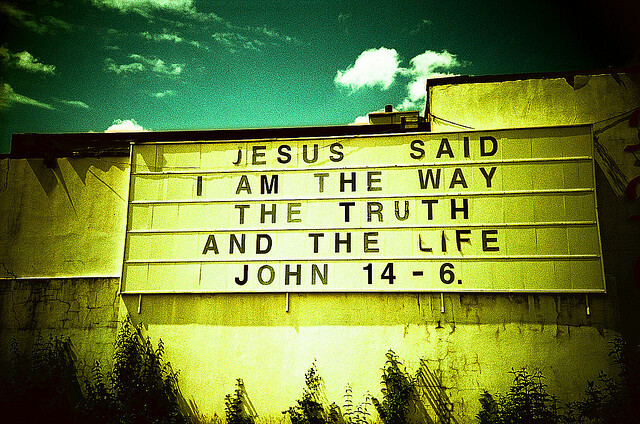 “I am the way, the truth, and the life” is Jesus’ (in)famous reply to Thomas’ request for directions to the Father (John 14:6). The text has been in dispute ever since, especially in light of disputes about salvation, exclusivism/inclusivism, and the sole Lordship of Christ. What does it mean for Jesus to be the “way, the truth, and the life”? How can a person be a life? Or a way? Or the truth? How are they connected? The way, the truth, and the life. He lays down three degrees, as if he had said, that he is the beginning, and the middle, and the end; and hence it follows that we ought to begin with him, to continue in him, and to end in him. We certainly ought not to seek for higher wisdom than that which leads us to eternal life, and he testifies that this life is to be found in him. Now the method of obtaining life is, to become new creatures. He declares, that we ought not to seek it anywhere else, and, at the same time, reminds us, that he is the way, by which alone we can arrive at it. That he may not fail us in any respect, he stretches out the hand to those who are going astray, and stoops so low as to guide sucking infants. Presenting himself as a leader, he does not leave his people in the middle of the course, but makes them partakers of the truth. At length he makes them enjoy the fruit of it, which is the most excellent and delightful thing that can be imagined. These are not primarily words of divisive exclusion (although they do testify to Jesus’ exclusive role as Savior), but of assuring grace. We might be tempted to look to our own plans, prayers, righteousness, special knowledge, inner strength, or find multiple mediators.Jesus here is telling us that he is the beginning, middle, and end of our salvation. It’s not just that we can’t turn anywhere else, but that by the mercy of God, we don’t need to. When it comes to gaining the life that is truly life, there’s no way around, or above, or away from Jesus. He himself is the source of that life. We don’t start by Jesus and do the rest ourselves, or move on to something deeper to get to life. No, at every step of the way, it is Jesus moving us along. He is the one who recreates us, brings us to participate in the truth that leads to life, and guides us by the hand to that life that we would not be able to find on our own strength. Reblogged this on A Glorious Revolution.